As someone who wants to continue to progress in self-actualization and the potential of who (and what) I was created to be, I found the following article to be very insightful, especially as I have found myself surrounded by some incredibly noxious individuals over the past several years. While I continue to recover and escape from the influence of negative/destructive/noxious personalities, I also remain vigilant for those traits to surface in new acquaintances or within myself. How about you? What are your noxious people struggles? Sit down, shut up, and hold on! Yes, I do own the road! People like you are the reason people like me need medication! Your kid may be an honor student, but you’re still an idiot! 1. Do not take internally. Toxic people tend to internalize everything and take it personally. Many believe that everyone and everything has been put on earth to make their lives more difficult. The truth is, most people are so busy focusing on their own lives, the chances they’re thinking about you are slim. Just as you always have good excuses for your bad behavior, so does everyone else – for example, the woman who accidentally swerved into your lane on the freeway almost certainly didn’t do it to annoy you. It’s just as likely she just got back from the eye doctor and her pupils were still dilated or a bee flew up her blouse. Remember, the only one out to get you is you. 2. In case of a spill, leave the area and do not return for an hour. This is great advice for toxic chemicals and toxic people. If you feel the need to let aggression spill over onto whomever’s closest, leave and don’t come back for at least an hour. Better yet, make it two. Often, even the most toxic people can blow off some steam simply by removing themselves from a situation. If you can’t actually get away, consider putting up some yellow “Caution” tape around your room to warn everyone else to stay away until you feel less volatile. 3. Induce vomiting. 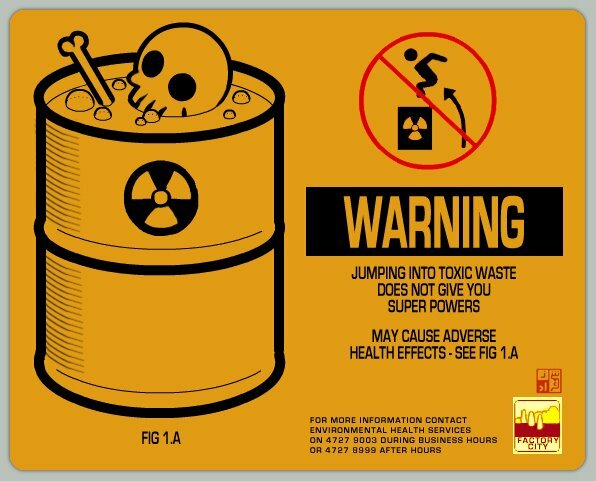 Purging your own internal poisons can help you reduce your toxicity to yourself and others. Too often toxic people let stressors build up and when they blow, they really blow. Anything you can do to help yourself feel less resentful and antagonistic that isn’t in itself harmful (such as drinking or screaming at someone) can be an effective stress management approach. The list is endless: biofeedback, deep-breathing, dancing, exercise, gardening, hobbies, laughter, lunch with friends, music, painting, pet therapy, play, visualization, yoga, etc. It is important that you regularly purge your poisons so they don’t build up, so make sure to practice some form of stress management that works for you every day. A good way to know when to use your anger and when to find another approach is to create a scale, rating the types of things that that you believe are truly worth getting upset about and staying upset about and those that are not. After all, you wouldn’t spray your whole yard with pesticide to get rid of one dandelion, right? Make the same choices in your life. 5. Keep away from heat. Just as you shouldn’t use toxic chemicals where they could catch fire, neither should you put yourself in situations that inflame your toxic tendencies. Whether it is an individual who pushes all the wrong buttons or circumstances that really get your dander up, try to avoid the heat, at least when you’re feeling most likely to erupt. 6. In case of contamination flush with water. It may sound simplistic, but water is a great way to reduce your toxicity. Take a bubble bath or a nice hot shower. Sit in a hot tub. Go for a swim. Stand under a waterfall. Let the water wash over you and remove any impurities before you step back into your problems. 7. Find alternatives that are less hazardous to your health. If you discovered a chemical you’d been using around your garden was poisonous, you’d probably try to find a different way to approach the problem. Most toxic people never contemplate their choices before blowing up at others. Here are some ideas: Read books and articles on how to nurture positive emotions, keep a diary to express your emotions and release a little steam every day, give yourself a ten minute rule before jumping into an argument, and ask people what they’re thinking instead of assuming they’re thinking something negative. 8. Learn to live with the weeds. Another strategy in the yard is just to let some weeds grow. After all, what’s a weed but a flower you didn’t plant? You can do the same in life – learn to accept that no one is perfect (including you) and that if you waste all your time trying to root out every weed, you’ll soon find yourself exhausted and cross with the world. A good example of a “weed” you could try to learn to accept: Let’s say you have a friend who you know in your heart is supportive and loving, yet he has recently done something that irked you. Is it worth your energy to make a big deal out of one slip-up in an otherwise good relationship, or is it better to save your energy to fight the bigger battles that really require your attention? 9. Keep out of reach of children and animals. The worst part about being a toxic person is that you not only poison your life and health, but you poison everyone around you, which can be especially harmful to your children and animals (who pick up on negativity without understanding what you’re saying.) If you feel extremely toxic, take a time out away from those who are most easily hurt. 10. Call a physician if irritation persists. If you recognize signs of toxicity in yourself and nothing you do on your own seems to help, it may be time for professional assistance. A therapist, an anger management class, or support group may be just what you need to get you started on the road to reducing the poisons that are destroying your life. Taking a few steps toward becoming a less toxic person will improve your health and make everyone around you less miserable. And, because we all create the life we live, you will find yours will have less anger and rage and more peace and joy. Even if there are a few dandelions growing here and there! BTW, Bart Campolo spoke at St. Paul’s tonight… it was awesome. You should definitely listen!!! You’ll like it!